The Texas Rangers used to be one of the biggest-spending teams in baseball, and there's no reason they always shouldn't be playing in a major market and with a terrific TV deal and relatively new stadium. So why are the Rangers among the many clubs who largely stood pat this offseason and are looking toward 2020 and beyond? For one, Texas knows it has no shot of winning the AL West with the powerful Houston Astros still in their prime. Second, I believe ownership is waiting until next offseason to start spending big again because the Rangers are moving into a new ballpark: Globe Life Field. Yes, even though their current stadium, Globe Life Park in Arlington, has only been around since 1994. That's Texas money for you. The Rangers have to keep up with Jerry Jones … but of course the public is paying for the new park just like the current one. Jeff Banister was fired as manager late last season with the Rangers on the way to a 67-win campaign that was their worst since 2014. The Rangers had won the AL West in each of Banister's first two seasons. He has been replaced by Chris Woodward, who takes his first managerial job. The former big-league utility infielder spent the past two years as the Dodgers' third-base coach. He was one of 10 guys interviewed by GM Jon Daniels, including 2018 Rangers bench coach Don Wakamatsu after he served as interim manager the final 10 games of the season. Texas opens the season March 28 in interleague action vs. the Cubs. The Rangers need a new face of the franchise because future Hall of Famer and one of the greatest third basemen in MLB history, Adrian Beltre, retired after 21 seasons. Beltre had spent the past eight with Texas, and by many numbers he's the best third-sacker ever. In addition to being the only third baseman ever with both 3,000 career hits and 400 homers, he leads all third basemen in career hits and RBIs, and ranks third in home runs behind only Mike Schmidt (548) and Eddie Mathews (512). Woodward was teammates with Beltre for a short period during the 2009 season with the Mariners. The only other major position player losses were infielder and top prospect Jurickson Profar being traded to Oakland and catcher Robinson Chirinos signing as a free agent with Houston. Finally receiving a chance to play regularly in 2018 after getting healthy, Profar hit .254 with 20 home runs and 77 RBIs. Profar was a little bit redundant on the Rangers and they sold high on him. Texas got young players back in the three-team deal with Oakland and Tampa Bay. Once again this year, the Rangers should hit a ton of homers but strike out plenty because that's what guys like Rougned Odor, Joey Gallo and Nomar Mazara do. The team looks to be weak on the corners with Asdrubal Cabrera replacing Beltre at third and Ronald Guzman at first. The projected lineup should be something like: DH Shin-Soo Choo, 2B Odor, SS Elvis Andrus (Rangers would love to dump his contract), OF Gallo, OF Mazara, 3B Cabrera, 1B Guzman, OF Delino DeShields, C Jeff Mathis/ Isiah Kiner-Falefa. Former ace Cole Hamels was traded during last season to the Cubs, who sent back Drew Smyly … sort of. Chicago actually traded Smyly to Texas in November essentially to save money when the Cubbies exercised the 2019 option on Hamels. Smyly used to be pretty good but has missed the past two seasons while recovering from Tommy John surgery. Yet he's penciled in as the No. 3 guy. 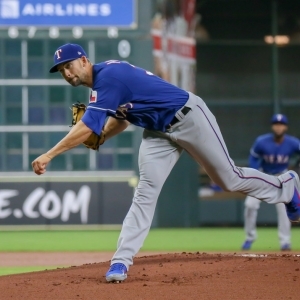 I don't want to say 31-year-old lefty Mike Minor is the worst ace in the majors, but he's the projected No. 1 and was 12-8 with a 4.18 ERA last year. The Rangers signed Lance Lynn to a three-year free-agent deal this offseason. He'll eat innings but not do much else. After last season, Edinson Volquez agreed to a one-year deal. The veteran righty did not pitch at all last season while recovering from ligament reconstruction surgery on his throwing elbow in 2017. The No. 5 starter figures to be one of Shelby Miller, Adrian Sampson or Ariel Jurado with rookie lefty Yohander Mendez once in the mix but now out the first half of the season. Closer Jose Leclerc was recently signed to a four-year extension. He took over as closer last August after Keone Kela was traded to the Pittsburgh Pirates. Leclerc was 2-3 with a 1.56 ERA and 12 saves in 59 appearances for Texas. At 5Dimes, Texas has an "over/under" win total of 71, with the under a slight favorite. The Rangers are +6600 to win the AL West, +20000 for the pennant and +50000 to win the franchise's first World Series. Gallo is a +1050 third-favorite to lead the majors in homers. With Seattle's teardown, Texas might avoid the AL West cellar again. Can this team win five more games than last year to top that 71 number? The Rangers steal many home games in the dog days of summer simply because they are used to that oppressive Texas weather and the opponents wilt in it. FanGraphs has the Rangers right at 71 wins. The lineup is decent, and if Smyly and Volquez are healthy, the rotation might not be horrible. I'll say 73 wins, so go over.